A dietary supplement for people, controlling their weight. It promotes metabolism normalization, elimination of toxic substances from the body, appetite reduction. It has soft laxative effect. Senna leaf — 0.3 g, corn silk — 0.3 g, knotgrass (polygonum) grass — 0.15 g, horsetail — 0.15 g, natural dried pineapple — 0.15 g, buckthorn bark — 0.15 g, nettle leaf — 0.1125 g, nettle grass — 0.1125 g, wood strawberry fruit and leaf — 0.06 g, nature identical aroma „Pineapple“ – 0.015 g.
Senna has laxative effect, which occurs 6-10 hours upon its intake; it has mild choleretic effect. Corn silk reduces appetite, and calms nerve system a bit, stimulates digestive system and metabolism. It accelerates carbohydrate metabolism, provides the body with vitamins and microelements. 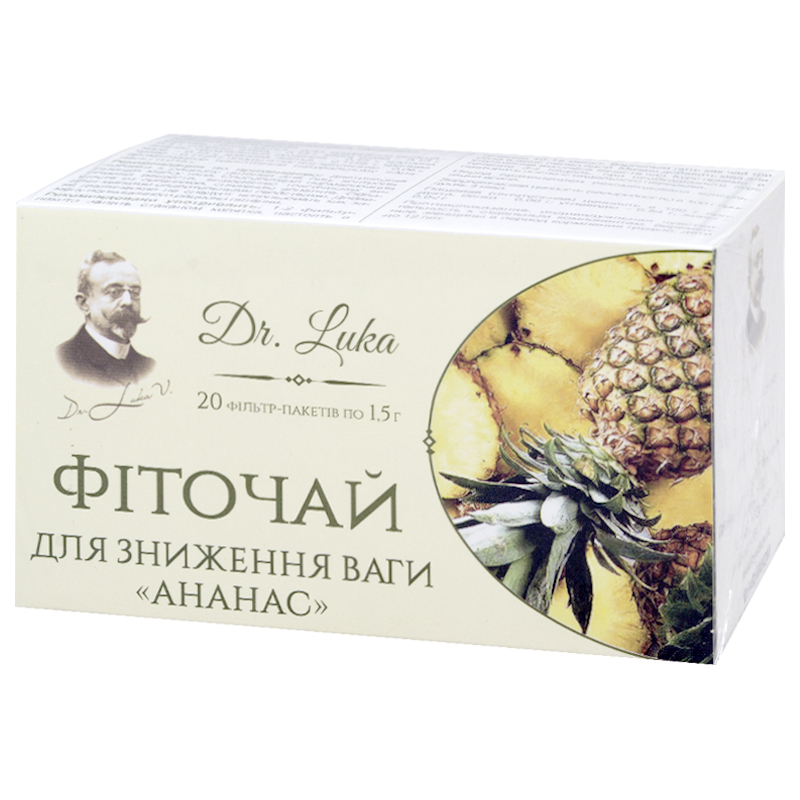 Pineapple has expressed anti-inflammatory, fat-burning and anti-edematous effects. Bromelain, contained in pineapple, normalizes proteins splitting and uptake, which in its turn leads to improvement of digestion, acceleration of metabolic processes. This enzyme is active both in the stomach and in the intestine, thus relieving constipation and flatulence. High content of potassium salts in the fruit promotes elimination of excess fluid from the tissues, thus reducing swelling in case of impaired renal function, as well as helps losing excess weight. Buckthorn intensifies colon peristalsis without irritating mucosa and without affecting small intestine. It is used for sustained constipations, burdened by poor development of abdominal muscles and sedentary lifestyle. It is used for spastic colitises and liver diseases. Possibility of buckthorn bark to soften and thin faecal matter helps in case of haemorrhoids and other diseases, connected with painful and injuring defecation. In composition of herbal mixtures, buckthorn acts as digesting stimulator. Nettle has vasodilating, choleretic, diuretic and anti-inflammatory effects, intensifies regeneration processes in the mucosa of the gastrointestinal tract. Wood strawberry has choleretic and diuretic properties. It improves metabolism, promotes elimination of salts from the body and is a source of vitamins, micro- and macroelements. Put 1-2 bags in a pot and add a glass of boiling water, let it infuse for 10-15 minutes. Adults drink as tea thrice a day before meals. To improve the taste add some honey. Term of use – 3 weeks, repeat in a two weeks’ break if necessary. Proteins — 0.06 g, carbohydrates — 0.53 g, fats — 0.02 g.